The Fellowship was fortunate enough to obtain a copy of WONDER WOMAN ’77 MEETS THE BIONIC WOMAN #2 from Dynamite Entertainment and DC Comics. The story is by Andy Mangels, with art by Judit Tondora, colors by Roland Pilcz, and letters by Tom Orzechowski & Lois Buhalis. Wonder Woman created by William Moulton Marston. After the explosive action of the first issue, things settle down a bit and we learn more about this mysterious group CASTRA and who's behind it. The interaction between Jamie and Diana is great; it makes one wish Lynda Carter and Lindsay Wagner had this opportunity. There are some great little in-jokes for fans of the comics and the television series. Judit Tondora’s art is beautiful; and this is possibly the most colorful book I’ve seen in months, courtesy of Roland Pilcz. All in all a really fun book that anyone can enjoy. Check it out. 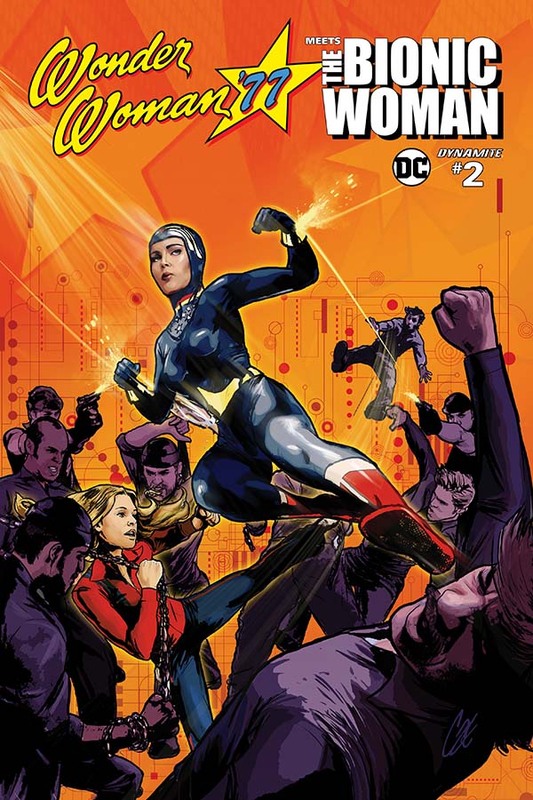 WONDER WOMAN ’77 MEETS THE BIONIC WOMAN #2 is in stores now or available at www.dynamite.com.